The new petrol engine delivers a fuel economy of 19.2kmpl! Yes, that is quite an abrupt start to this review, but it’s a major update that the Audi A3 facelift receives. Here’s a look at what else has changed. - Full-LED headlights are new (not offered as standard). - New set of 16-inch alloy wheels. - Tail lights feature dynamic indicators. The new A3 retains its compact size (length = 4,456mm i.e. shorter than even the Maruti Ciaz) and classy design, but with a few minor changes, looks fresher. It’d take a keen eye to point out the differences, but put the old car and facelift side-by-side and you will find that the latter looks more futuristic. The chrome outlined front grille is now hexagonal and gets a sharper set of headlamps on either side. Additionally, like the recently updated CLA, the A3 can be had with full-LED headlights, while bi-xenon headlamps will be offered as standard. The front bumper is more chiseled too and sports a slimmer set of air vents. The side profile appears no different, but look closely and you notice that the 16-inch wheels feature a slightly different and sportier design. Additionally, the engine badging on the front fender has been skipped. Over to the rear, the tail lights have the same shape, but the internal detailing is new and you get, what Audi likes to call, a three-dimensional effect. What’s more is that the A3’s rear lights get dynamic indicators, which look quite cool in action. - New three-spoke steering wheel. - Restyled, frameless interior rear view mirror. - Updated Multi-Media Interface (MMI) screen. On the inside, the cabin is largely the same. What you do get, though, is a new three-spoke steering wheel that feels great to grip and looks like the same unit you get in the Audi R8! It is adjustable for both rake and reach, and finding a good driving position is easy. The instrument cluster still has the classic analogue dials with Multi Information Dislay in the middle layout. You don’t get the A4’s virtual cockpit, but the setup is very easy to read and displays a good amount of information, including turn-by-turn directions of the navigation system on the multi-information display - so you don’t have to turn your attention towards the Multi-Media Interface (MMI) screen. Speaking of which, the MMI system has been updated and now features a better display. It isn’t a touchscreen, so you use the dial behind the gear-lever to shuffle between its functions. These functions include navigation, telephony, car settings and the entertainment system, among others. Features like the phonebook and navigation can be operated by voice commands. So if you’re looking for a petrol pump, you can hit the button and say, “I need fuel”, and the MMI display shows you the closest options. It’s quite intuitive and understands Indian accents easily. The overall quality is impeccable, though the CLA’s trim quality has a slight upper hand and the Mercedes offers a better rear camera, too. However, the A3 gets features like dual-zone climate control, rear AC vents and front/rear parking sensors, all of which, the CLA misses out on. Other features available include a panoramic sunroof, Milano leather upholstery and the Audi Phone Box i.e. an inductive charger for your cellphone. What’s really nice, though, is how ergonomically everything has been laid out and how simple controlling all the features is. Additionally, the A3 offers decent cabin space for a compact luxury car. No, two six-footers cannot sit one behind the other and seating three at the rear is too much of a squeeze, but four average-heighted adults can be accommodated. Just don’t expect Skoda Superb levels of roominess, even though both cars fall into a similar price range. Also, not only is the overall headroom better than its rival, the CLA’s; unlike the Mercedes, the spare wheel (space-saver) sits under the boot floor. This makes the 425-litre boot genuinely usable and the loading-mouth is wider too. Overall, the Audi A3 is quite practical for a compact luxury car. - New 1.4-litre petrol engine. - Power reduces by 30PS, but fuel-efficiency improves by nearly 3kmpl. - Engine is nearly 100kg lighter than the old 1.8-litre unit. The biggest change in the Audi A3 facelift is its new petrol engine. The motor is shared with the new Audi A4 and is a smaller, 1.4-litre turbo-petrol unit (earlier 1.8-litre). The smaller displacement has resulted in a loss of power as it makes 150PS of power (a drop of 30PS), but the peak torque remains the same at 250Nm. The end result is both negative and positive. On the downside, the A3 petrol now completes the 0-100kmph sprint in 8.2 seconds (earlier 7.3 seconds), which is slower, but not by much. On the plus-side, the claimed fuel efficiency figure goes up from 16.60kmpl to a whopping 19.20kmpl! It’s obvious that the positive outweighs the negative. What’s really amazing is how refined this engine is, especially when compared to the CLA 200. Start-up the car (by twisting the key, since there’s no push-button starter), and you really have to focus to hear the engine actually running. The motor is butter-smooth, and only gets vocal when you rev it hard. Even then, there isn’t a hint of vibrations anywhere in the cabin and the only noise that comes in is from the tyres, which are a bit noisy, especially over concrete roads. The ‘35 TFSI’ powerplant is perfect for city driving, as it is very sensitive to throttle inputs, while the 7-speed DSG transmission offers eerily smooth gear changes when you go easy on the accelerator. It’s noticeably smoother than the CLA’s gearbox. Even when you slam the pedal, the transmission is lightning-quick, yet, never jerky. The only thing missing are paddle-shifters, which is really quite unfortunate, since the powertrain is quite engaging to use. It does feel strained around 5,000rpm and above, but offers good punch for quick overtakes. Additionally, with the 7-speed transmission, it works nicely as a highway cruiser too. At 100kmph, the engine is hovering just under 2,000rpm, which will result in a longer travel range from the 50-litre fuel tank. This engine also features cylinder-deactivation, so whenever possible, the car runs on two cylinders out of four to improve efficiency, and runs on all four when the performance is required. The 2.0-litre diesel engine has been carried over as is, and produces 143PS of power and 320Nm of torque. While the petrol is super-silent, the diesel is audible. There is a small amount of vibration that can be felt while idling, but things smoothen out on the move. You need to merely nudge the accelerator pedal in the diesel to get going. While the engine is quite free-revving, there’s no need to push it beyond 3,500rpm because that’s where the engine starts to feel strained. Thanks to the oodles of low-end torque available from just 1,750rpm, the diesel is a great cruiser, while the six-speed automatic transmission offers smooth and quick gear changes. However, here too you can’t help but reach behind the steering, wishing you had paddle-shifters. At 100kmph, the diesel too sits at just under 2,000rpm in 6th gear, which means once you set into a cruise, the engine can barely be heard. With a claimed fuel economy of 20.38kmpl, the diesel A3 is only marginally more efficient than the petrol, but that’s still quite frugal and it's over 2kmpl better than the CLA diesel. The A3’s ride quality is comfortable and suspension is quite silent too. Over smooth or undulating roads, the car feels planted and small bumps or potholes are brushed off with ease. It can even go through broken patches at decent speeds and neither the front nor the rear passengers will have any complaints. The handling, however, is a mixed bag. While the suspension and chassis have been well-tuned and make the A3 quite stable, the steering is devoid of feedback and leaves you guessing. The A3 is not a car for chauffeur-driven owners, so the steering could have been more communicative and direct. However, at city speeds, it is one-finger-light and zipping through even narrow and crowded markets is a breeze. The Audi A3’s facelift adds some substantial new updates, the biggest of which, is the new petrol engine. Not only is it good to drive, it’s efficient too. With buyers deviating from diesel engines, this motor is exactly what could tip the scales in favour of the Audi A3. Fun fact: The new Audi A4 petrol is selling 3-4 times more than the old model’s petrol variant, primarily because of this frugal engine. However, while the new design is more handsome and benefits from Audi’s lighting systems, it’s still understated and not as attention-grabbing as the CLA’s exterior. This could be a disadvantage since the young buyers the A3 is targeted at generally like flamboyant designs. Buyer preference notwithstanding, the new Audi A3 makes a very strong case to consider. Features like the sunroof and 7 airbags now come as standard, the petrol variant is now available in the fully-loaded Technology variant as well, and while the top-end diesel costs a meagre Rs 15,000 more, the Premium Plus diesel is cheaper by a healthy Rs 60,000! 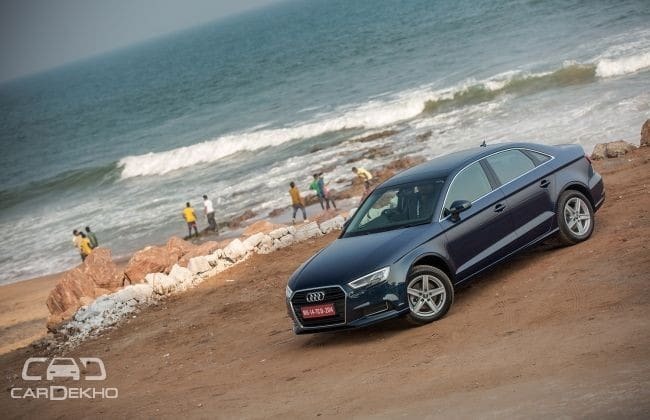 With prices starting at Rs 30.50 lakh and going up to Rs 35.80 lakh (ex-showroom Delhi), the A3 facelift is an even better deal than before.